Chiroti is a famous sweet in Karnataka and Maharashtra states. 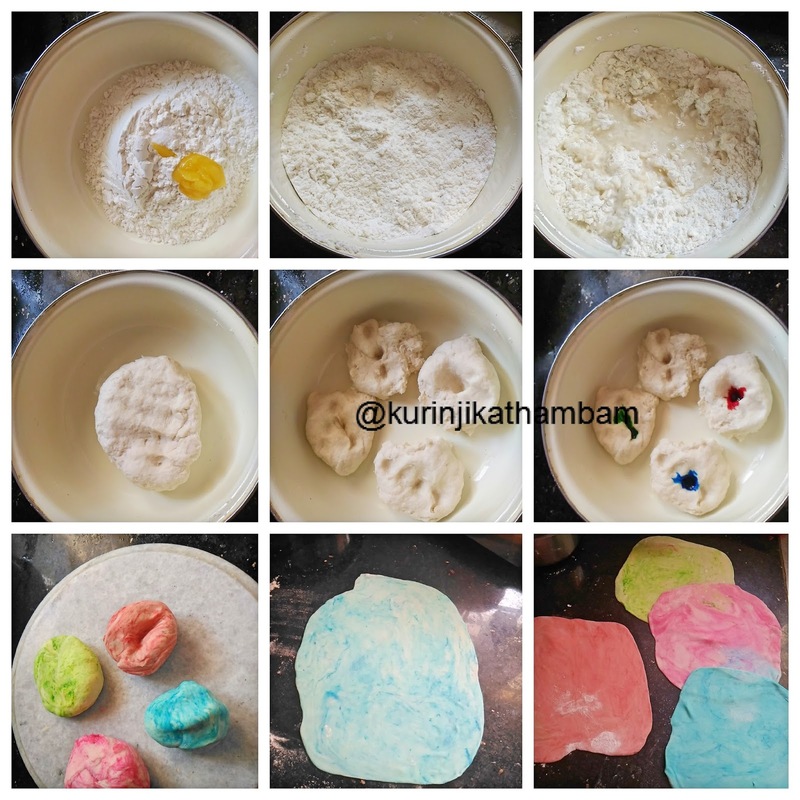 When I was thinking of preparing a colorful sweet for Holi, I thought of making Cheroti in multi-colour. I remember seeing a Chiroti in tri-colour of Indian Flag in a TV program 15 years back. Preparation Time: 20 mins | Cooking Time: 15 mins | Yields: 20 nos. 1. In a wide bowl, add maida, salt and 2 tbsp of ghee. Mix them well with your fingers. Now this should look like a bread crumbs. 2. Then add water little by little and knead it into a soft dough. 3. Divide this dough into 4 equal parts. Add different food colors to each ball and make atleast 4 different color dough. Keep it aside for 30 mins. 4. Meanwhile, add rice flour and melted ghee in a small bowl. Mix them well and make them into smooth paste. Add more ghee till you bring it into paste consistency. 5. For sugar syrup add the sugar and water in a heavy bottom pan. Cook in a medium heat till the syrup reaches single string consistency. Then add either cardamom or cardamom powder. Mix them well and keep it aside. 6. 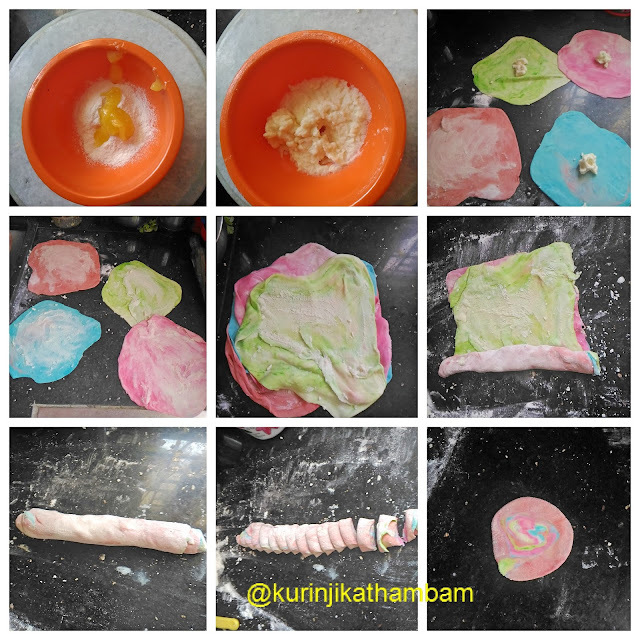 Now roll the 4 colors dough into 4 rotis using dry flour. 7. Apply rice flour paste (from 4) over the rotis. 8. Now place one color roti over another color roti. Again place 3rd color roti over the previous rotis. Again place the 4th color roti over these rotis. 9. Now roll these rotis gently into a single log. At its end apply water and roll them tightly. 10. Now cut this log into ½ inch thickness circles. 11. Again roll these rotis into a small circles using the rolling pin. 12. Now heat the oil in a frying pan and slide the roti. After few seconds, press it with the help of the ladle. After few seconds, turn over it carefully and fry the roti till it turns into golden on both sides. 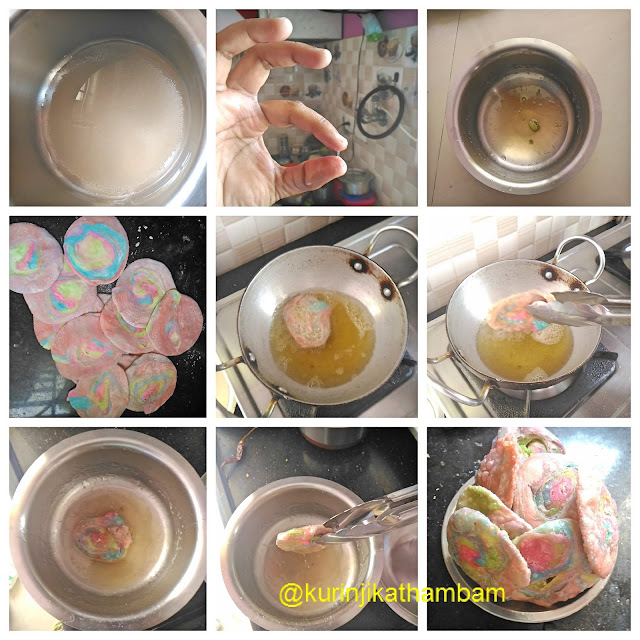 Then take it out from the oil and drain the oil using the tissue paper. 13. Then immediately immerse the hot chiroti in the sugar syrup. Allow it for few seconds to absorb the sugar syrup and take it out from the syrup and keep it aside. 14. You can do these two steps (12 and 13) for all the rotis. 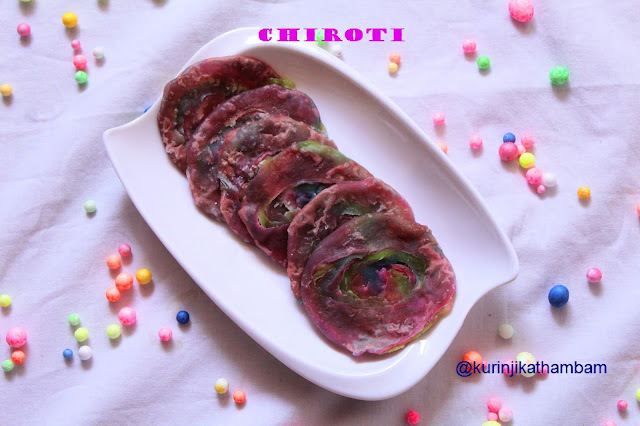 Colorful and tasty Chiroti is ready to serve. 1. Using colors is optional. You can make Chiroti without colors too.